This recipe will make about 25 cannoli. If you don’t want to make this many cannoli, you can make less of the creamy filling, but I would still make this amount of the cookie batter because it will last in the fridge for a few days. This was my first time making cannoli, I’d been avoiding it because I don’t own any cannoli tubes and the idea of frying 1 or 2 of these at a time seemed tedious. 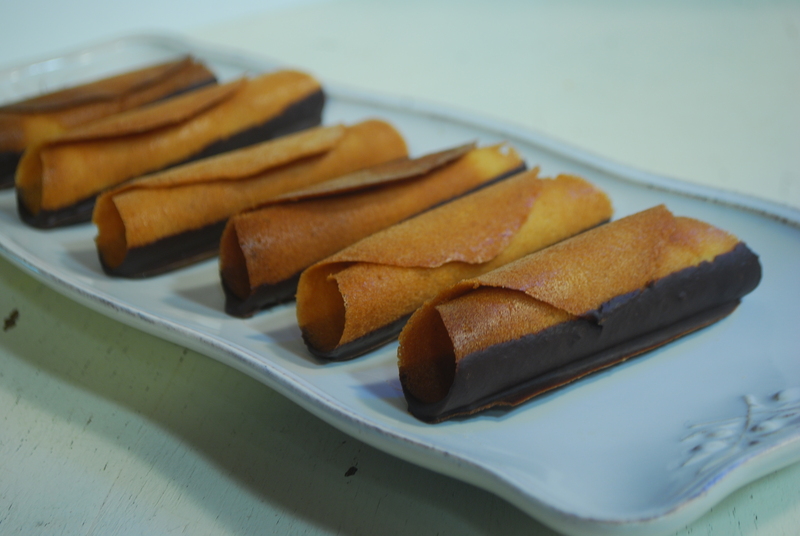 The cookie that I use as a cannoli shell is actually a classic tuile and is much easier to work with, while still achieving the desired effect. Mix together the egg whites and sugar. Add melted butter that has been cooled, so as not to cook the egg white. Whisk in the vanilla, cinnamon, clove, and flour until combined. Cover with plastic wrap and let sit for a couple of hours. Preheat the oven to 350F. Place a spoonful of batter onto a cookie sheet that has been lined with parchment paper or a silicone mat. Spread out the batter using a concentric motion with the underside of the spoon. Bake for about 10 minutes or until they are a light golden brown. 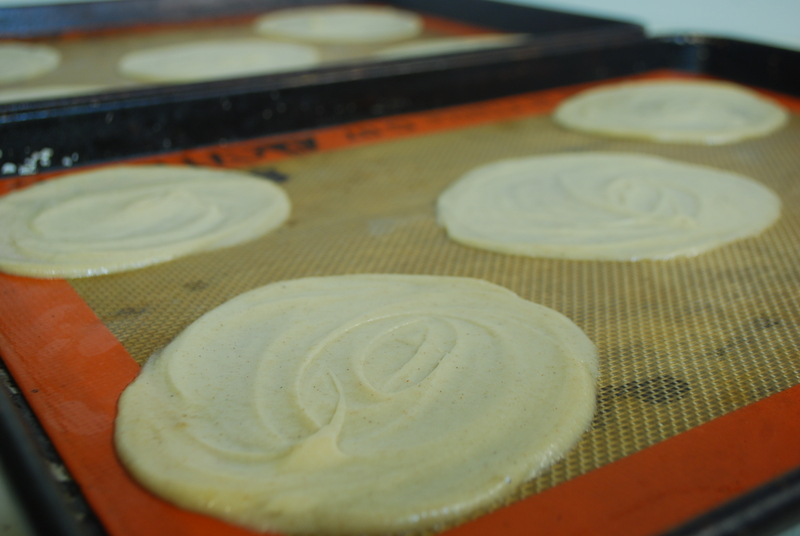 Some tuiles will cook faster than others, so take them off individually as they finish baking. Roll into a tube shape within 10-15 seconds after taking out of the oven, otherwise they will not be pliable enough to shape. If you end up with some cookies that you did not roll in time, that’s ok, it means you are a normal, imperfect, but still awesome person. If the worst thing that happens in your day is that you end up with a few flat tuile cookies, I’d say you are doing quite well in life. To make the chocolate ganache, heat the cream in a double boiler, then add the chocolate and take off the heat. The hot cream will melt the chocolate. Stir to incorporate, then start dipping your tuiles. You get to dip them in the chocolate any which way you like. If you prefer, you can drizzle chocolate on the top. I like dipping the whole bottom in to help with balance of the cannoli. Allow the chocolate to cool and harden. To make the creamy filling, whip the cream with the agave nectar, then fold in the ricotta cheese. 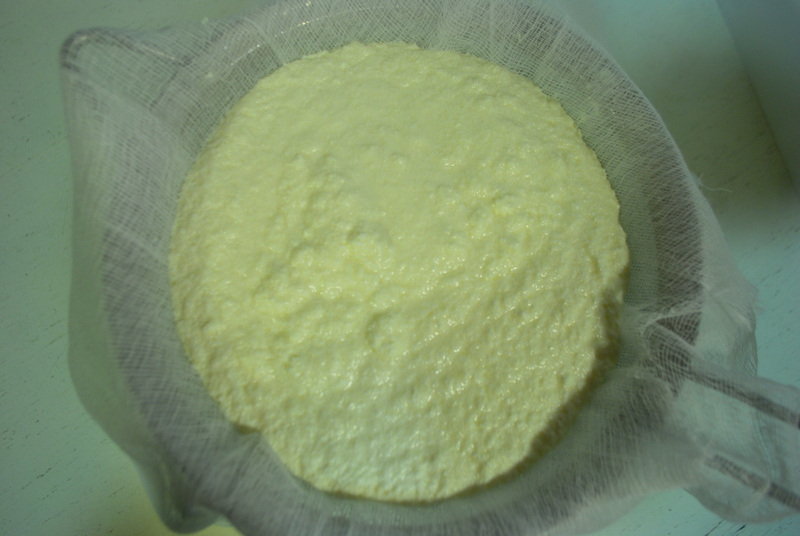 If you want to make your own ricotta, go for it! It is easier than you think. Find my recipe here. Fill a pastry bag with the creamy filling; a ziplock bag with a corner cut out will also do the job. Pipe filling into each side of the cannoli. 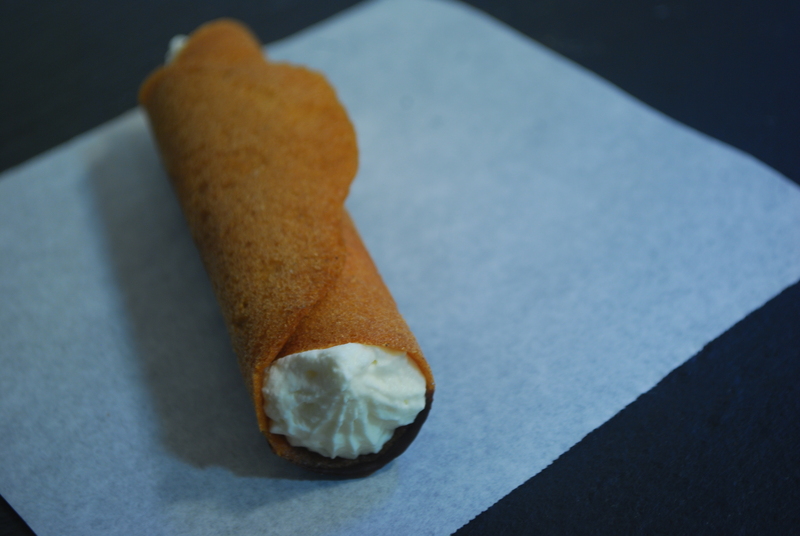 Do not add the creamy filling too long before you plan to serve your cannoli or you will have a sad, soggy cookie. I hope that this cannoli recipe encourages you, like it did me, to brave the world of creating this sweet Italian delicacy!